WHICH HUMIDIFIER TYPE IS BEST FOR YOU? 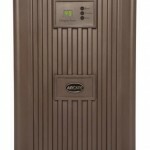 Find our more about what a warm mist humidifier is. 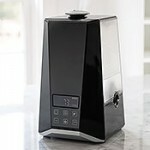 Find out what our top 10 warm mist humidifiers are. Find our more about what a cold mist humidifier is. Find out what our top 10 cold mist humidifiers are. The best way to know whether a warm mist humidifier is for you is to be thinking about how you breathe in a sauna or steam room. If you feel claustrophobic and struggle to breathe, you should avoid this type of humidifier. But if you inhale well in these steamy conditions, then a warm mist is the best option for you. Try the Vicks Warm Mist Humidifier or InnoGear® 100ml Aromatherapy Essential Oil. 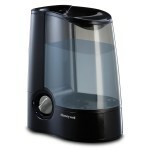 Allergy or asthma sufferers will have an easier time breathing with a cool mist humidifier. By extracting any impurities from the air, these humidifiers will allow you breathe in the cleanest air possible. Try the Crane Ultrasonic Cool Mist Humidifier or ReMEDies Ultrasonic Cool Mist Humidifier . Find out which type of humidifier suits your homes best here. Learn more about the function and benefits of an ultrasonic humidifier. Humidifiers come in two main different types. These are the ultrasonic humidifier and the evaporative humidifier. Both have the same intended function and those looking for a humidifier will want to conduct research into which type is best for them and their home. 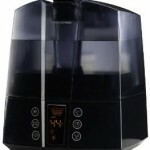 The PowerPure 5000 is comfortably one of the best ultrasonic humidifiers on the market. Put simply, it excels in almost every area, and should be at the top of your list for research when you’re looking to buy an ultrasonic humidifier. We all want the benefits of what a humidifier can bring – better humidity in the air means better skin, no chapped lips, fewer nosebleeds, less susceptibility to allergies and much more. 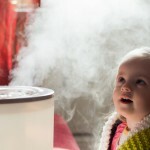 Some less sophisticated humidifiers can also bring problems with them. In hard water areas, or if the user does not look after their humidifier, white dust can build up in the unit and be emitted around the house along with the moist air. The Air O Swiss 7147 Ultrasonic Humidifier is extremely quiet and a very attractive model. It is advertised as being “whisper quiet”, and it is indeed a very quiet humidifier. Aside from a gentle hum, you will barely notice it at all. Because a humidifier is water-based, it is prone to start growing mildew and mold if it is not cleaned or maintain. If you don’t clean and maintain your humidifier, it can cause some serious issues. Find out more ways to keep your humidifier in its best condition. The reason people buy humidifiers is to balance the levels of moisture in the air of their home. Particularly during winter months, people can suffer from a number of ailments brought about by low levels of moisture in the air. These ailments include nosebleeds, cracked lips, dry skin, sinus infections, snoring, itchy skin and more. A humidifier can even help maintain the condition of your wallpaper and furniture. If you use a portable humidifier for certain rooms or a whole house humidifier that attaches to your furnace, the water that is used by the humidifier will most likely come from your home’s water supply. As you probably know, the water that is used in our homes is not generally the cleanest water and can cause problems with your humidifier. Find out more about the effects of hard water on your humidifier. Finding a product that is not only affordable, but gets the job done, can be hard. Going through countless online reviews and asking friends and family for their opinions is very helpful, but sometime you don’t have this option. With outer expenses to pay, the last thing you want to do is pay over $100 for a humidifier. Whether you’re purchasing your humidifier to help with dry skin, clear up congestion or just to add moisture into your home, finding one at the right price can be extremely difficult. These useful appliances come in all shape, sizes and brands that can cost anything between $15 to $200. If you’re on a budget, finding a truly affordable humidifier that is efficient can be hard, so we decided to do all the handwork for you. Check out all these amazing humidifier that are affordable and reliable.